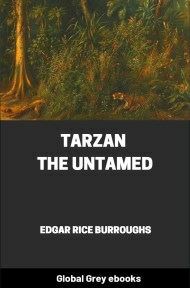 This is the seventh in the series of books about the title character Tarzan. 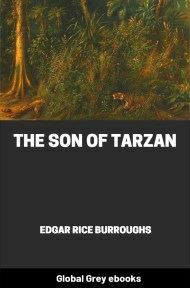 Tarzan defends his jungle home from invaders during World War I and then must protect an Englishman and a German spy from a lost civilization of lion-men. Hauptmann Fritz Schneider trudged wearily through the somber aisles of the dark forest. Sweat rolled down his bullet head and stood upon his heavy jowls and bull neck. His lieutenant marched beside him while Underlieutenant von Goss brought up the rear, following with a handful of askaris the tired and all but exhausted porters whom the black soldiers, following the example of their white officer, encouraged with the sharp points of bayonets and the metal-shod butts of rifles. There were no porters within reach of Hauptmann Schneider so he vented his Prussian spleen upon the askaris nearest at hand, yet with greater circumspection since these men bore loaded rifles—and the three white men were alone with them in the heart of Africa. 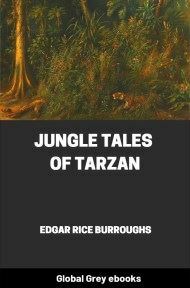 Ahead of the hauptmann marched half his company, behind him the other half—thus were the dangers of the savage jungle minimized for the German captain. At the forefront of the column staggered two naked savages fastened to each other by a neck chain. These were the native guides impressed into the service of Kultur and upon their poor, bruised bodies Kultur's brand was revealed in divers cruel wounds and bruises. 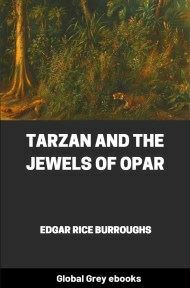 It is true that the guides had led the party astray; but this is the way of most African guides. Nor did it matter that ignorance rather than evil intent had been the cause of their failure. 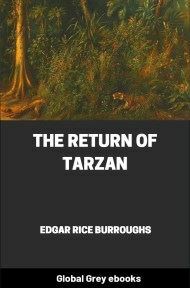 It was enough for Hauptmann Fritz Schneider to know that he was lost in the African wilderness and that he had at hand human beings less powerful than he who could be made to suffer by torture. That he did not kill them outright was partially due to a faint hope that they might eventually prove the means of extricating him from his difficulties and partially that so long as they lived they might still be made to suffer. The poor creatures, hoping that chance might lead them at last upon the right trail, insisted that they knew the way and so led on through a dismal forest along a winding game trail trodden deep by the feet of countless generations of the savage denizens of the jungle. It was at the edge of this plain which came suddenly and unexpectedly before the eyes of the guides that their sad hearts beat with renewed hope. Here the hauptmann drew a deep sigh of relief, for after days of hopeless wandering through almost impenetrable jungle the broad vista of waving grasses dotted here and there with open park like woods and in the far distance the winding line of green shrubbery that denoted a river appeared to the European a veritable heaven. 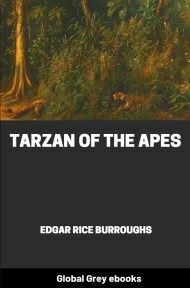 It was in a better frame of mind that the small force set out across the open country toward the trim and well-kept farm buildings of John Clayton, Lord Greystoke; but disappointment was to be their lot since neither Tarzan of the Apes nor his son was at home.